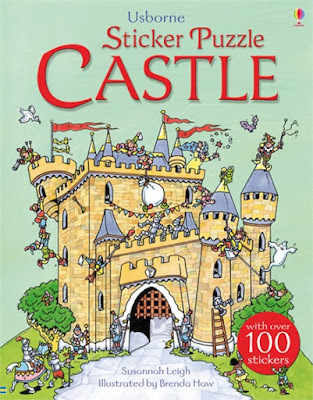 Update: Since I published this post on the Usborne Young Puzzle books, the publisher has come out with a new twist on these books in the form of "sticker" puzzle books. 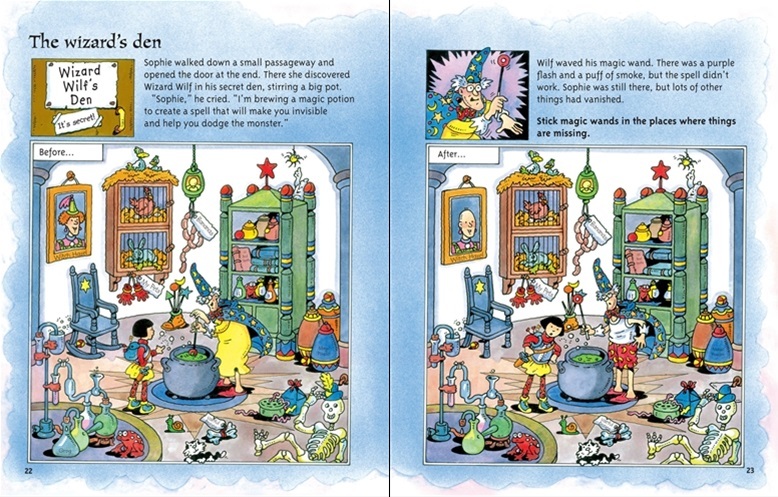 These sticker books are identical to the originals, but also include more than one hundred stickers that young readers can use. Other than that, it's the same book. They can be hard to find on some online booksellers, so I included a link to The Bookdepository (at the end of this post), which currently stocks it. Dad, close your eyes! ", commands my son. A click can be heard as he presses a button. The hard disk in my computer starts whirring. He stares at me with a cheeky grin: "Maggggic!" My baby boy is right. That's some magic, if you think about it. Press a button - the monitor lights up and the computer boots. Sometimes we forget that book can create their own type of magic. And no, I'm not thinking of the magic you find in an Edward Eager book or E.B. Nesbit story. I mean real magic in the form of a smashing read-aloud puzzle book! "A read-aloud puzzle book? No way!" you say. 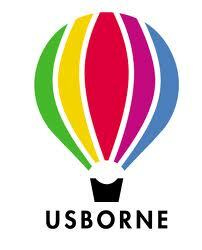 I must admit I came across the Usborne Young Puzzle book series completely by chance. Namely, I remember thinking how reading aloud "pure" fiction or non-fiction was not enough, and that my kids would need to perfect their book-related visual, reasoning and "page navigation" skills before they even start to learn to read (one day). What's better than the fantastic I Spy books and Where's Waldo, I thought. I got many of them for my home library, but still something was missing in these books. Both I Spy and Where's Waldo had that fantastic element of challenge and visual sport that all kids enjoy, yet my kids were still young .. they also needed a story to keep them fascinated. It's not only about flexing eye muscles, a great book also fires all those other synapses in the brain! Obviously, at this time I needed I Spy books - but with a story and with ... an adventure! So, I ordered the first of many brightly colored Usborne Young Puzzle books that are now gracing the bookshelves of our home. Just one initially. To test whether these Young Puzzle books were any good. Imagine my surprise when I received something that was all that I had hoped for ... and then more. This is creative thinking in a perfect package! 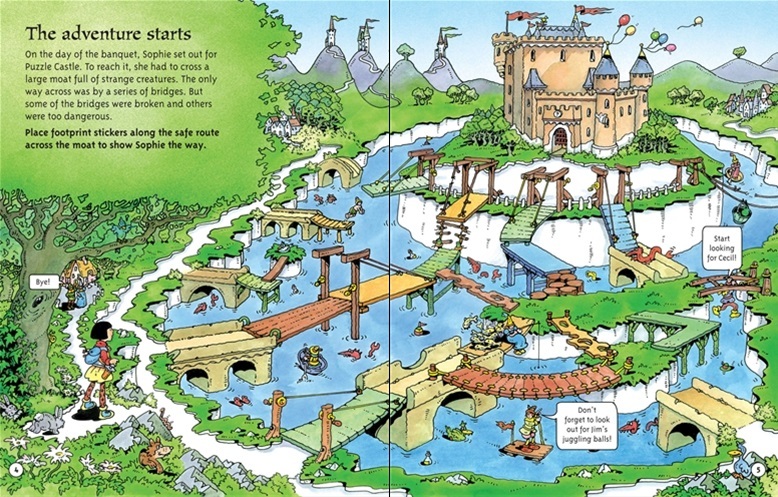 Puzzle Castle (and the other Young Puzzle Books are a perfect blend of entertainment, education and creativity - and the balance of all components is excellent. I don't know what is it about the Young Puzzle books that my kids and I find more appealing. 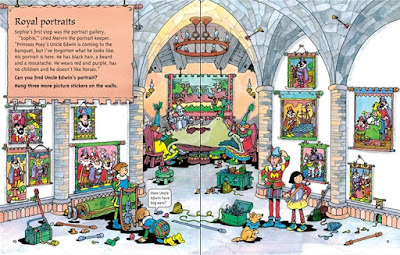 Is it the fantastic padded (polyurethane) large hardcover format (the padding is so comfortable for small and big hands), or the comic-like illustrations, the different types of puzzles on every double page, or the "I Spy" element of fun to find hidden objects or persons. These puzzle books just blow you away. Over the past several months, what have we been doing every other day? My twins pick out an Usborne Young Puzzle book from the shelves, then they march me up to the couch. They sit on each side, I sit in the middle and the book is firmly in my lap. Then my girl and boy pretend that they do not know the stories behind all the challenges in this book and I start reading instructions on every page and then the adventure starts. Boom! Point! Slam! It's a competition between these two pumpkins! Who finds what first. Who solves which puzzle first. Puzzle after creative puzzle is solved. Mazes, find missing pieces, match the animal to the name, discover hidden trails, logic questions, memory challenges, you name it - it's inside. Question after question is asked. And my little readers want more. Let me admit one thing. There is one drawback to these Usborne Young Puzzle books - there simply is no end to the read aloud sessions. My kids simply will not let go of them. My baby girl and baby boy tire me out and eventually I have to stop reading and get up. True fact. By the way, take care to order the (padded) hardcover version, not the paperback. These padded versions will last you an eternity. Usborne Young Puzzles is just one of a series of puzzle story book editions published by Usborne Publishing - so be careful not to mix them up. The Puzzle Journey books (4 titles) are for young kids - I haven't checked them out. The Young Puzzle books (around 19 titles) - these are the one I am raving about in this post! They are for slightly older kids than the previous two. They are still over the head of my kids, who understand around 70% of the challenges. If you can't find them - look for the Young Puzzle Sticker books, which are the same product - but include stickers. The Puzzle Adventures books (around 14 titles) - for the oldest kids - really exciting books as well! Bought these as well. OK, enough with all this Puzzle Castle hype, you say. What goes on in the book itself? 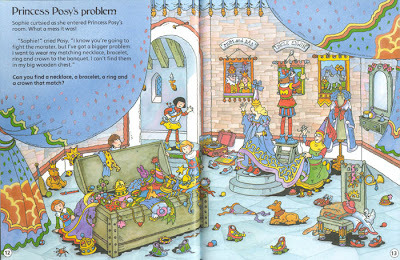 Well, a brave knight called Sophie is invited by her friend Titus the Timid to come to Puzzle Castle to a grand banquet. 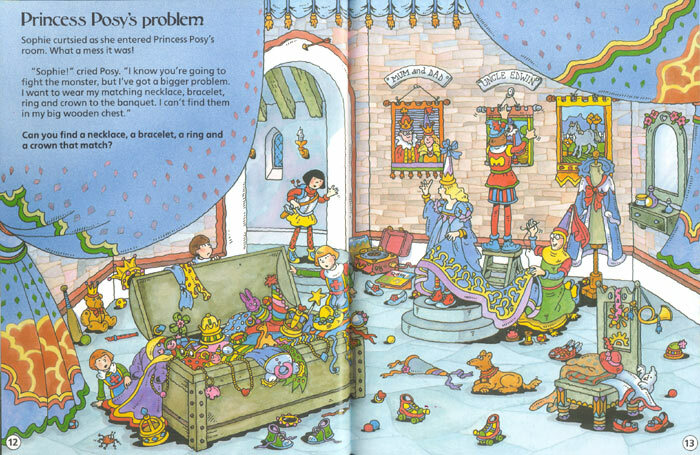 During her visit, Sophie will have to find 10 pieces of equipment (flashlight, protection shield, phrase book, extra-brave toffees, run-faster shoes, umbrella, key, mystery box, useful string and monster protection helmet) that are scattered around the entire book. Also, on every double page, readers are expected to find a friendly ghost Cecil, who is hiding spookily, and juggling balls lost by castle inhabitant Jester Jim. 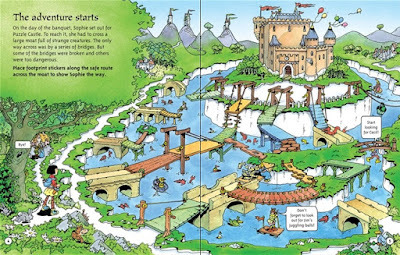 Puzzle Castle is a unique and great way to bring a new form of interaction, conversation, logical puzzles and critical visual skills into play during your read-alouds. When I look back, I know that the decision to purchase these books was really fortunate. My kids will be enjoying them for years and I am sure that they will be firm favorites even when they learn to read! For my family, Puzzle Castle and its "puzzle siblings" are simply irreplaceable. We have spent hours and days poring over these books. And it shows. If they are somewhere silent in the house, half of the time its because they are with a Puzzle Book in their lap. Baby boy and baby girl have gained some impressive new book-related skills and understanding. In the words of my baby boy - they work like "Maggggic" !! stimulation for children of all ages. Self-confidence is likewise reached when kids play puzzle games. Kids feel more confident of themselves right after they have accomplished the puzzle and obtain praises or kind comments from their moms and dads or teachers. Nothing compares to the happiness that children obtain from taking part in puzzles.